← Rain drops keep falling on my head…after another soggy day in May I’m beginning to wonder if the rain will ever stop. My experience of the NHS has been, shall I say sporadic with sudden major one off events happening at irregular intervals and on the whole I would say it has been a positive experience. But today I am happy to say this grand old dame of the British Welfare State exceeded my expectations and has left me feeling not only proud of this national institution but also protective of a service that is beyond compare, particularly given it is for the most part, free. From the initial GP consultation to the final discharge, the process of my treatment was seamless and the system definitely worked and it has made me realise just how lucky we are to have such dedicated, professional and caring people who really want to do the best they can for the patient. It was at the unearthly hour of 6.15am I found myself enroute to Dorset County Hospital, Dorchester to have a procedure called radiofrequency ablation of a varicose leg vein. (That’s for a collapsed vein that results in the blood not returning back up the leg so the lower leg swells and becomes discoloured and could end up ulcerated). 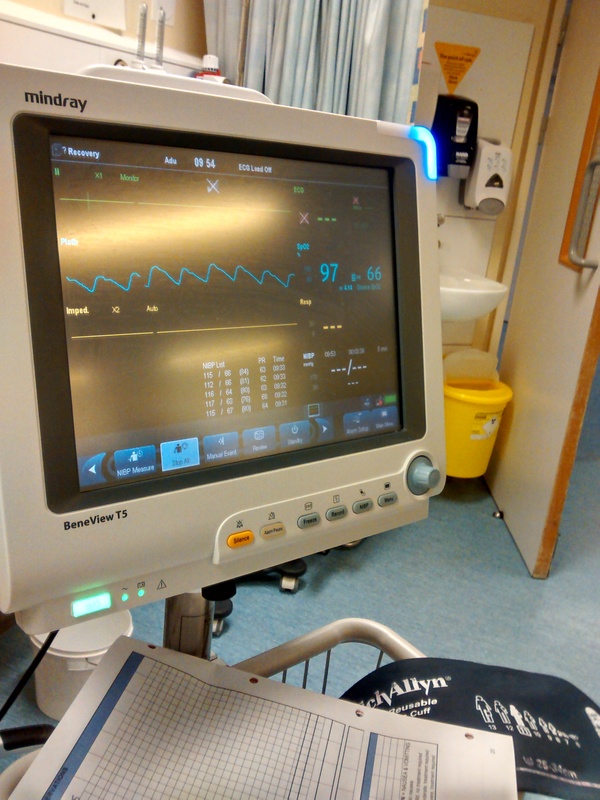 To say I was nervous would be an understatement – as I said, my experience of hospitals is sporadic and usually due to a serious accident involving my children! Anyhow, I found myself, along with a crowd of around 12 people, waiting outside the South Wing at exactly 7am. The admission procedure was straight forward, from my designated chair with hospital gown awaiting (aren’t they just the most glamorous of clothing), to the cardboard case they gave me to put my glasses during the operation. I was informed I was first on the list and it was then that the nerves kicked in. The surgeon, Mr Watson duly arrived to explain what he planned to do, but given my nerves were already in tatters, I reassured him I really didn’t need to know! 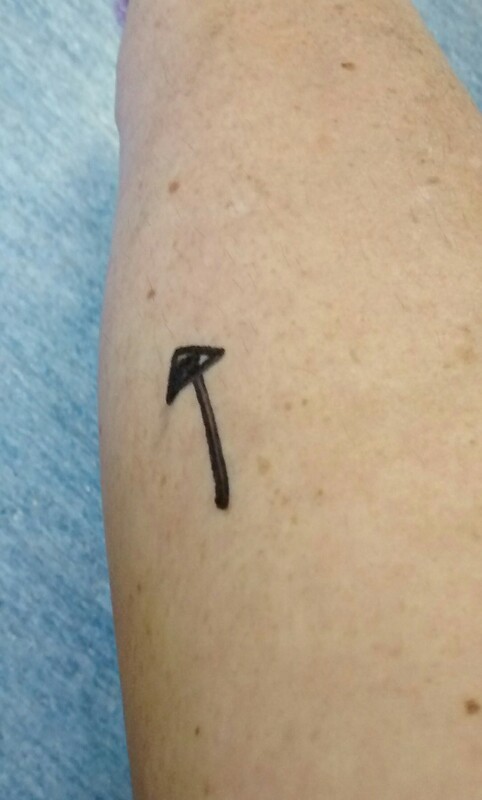 He put a bold ‘this way down’ arrow on my leg. To cut to the chase, by 8.15 I was on my way to surgery so no going back now. The team was utterly brilliant. I had Mark who sat close by so he could deal with any of my concerns, the surgeon Mr Watson, the anaesthetist and the radiographer. I won’t go into the details of the operation, in fact just three minutes in I decided I really didn’t want a running commentary from Mr Watson, so a quick word from Mark and I only had to suffer the physical pain without the accompanying graphic detail of each incision! By 9.20 it was all over and the finishing touches were being added. I even managed to crack a couple of jokes with the staff that had them laughing rather loudly. Onto the recovery room and then discharged so I was ready to leave at 10.15. So another one off experience, but one that has left me feeling reassured that even with the government interference, the bureaucracy and red tape and target culture, the people I met today could not have been more caring or concerned by my welfare. I just hope the exceptional level of service I experienced today will still be there for tomorrow’s generation and that Bevan’s vision to monitor the nation’s health will be sustainable for many years to come. 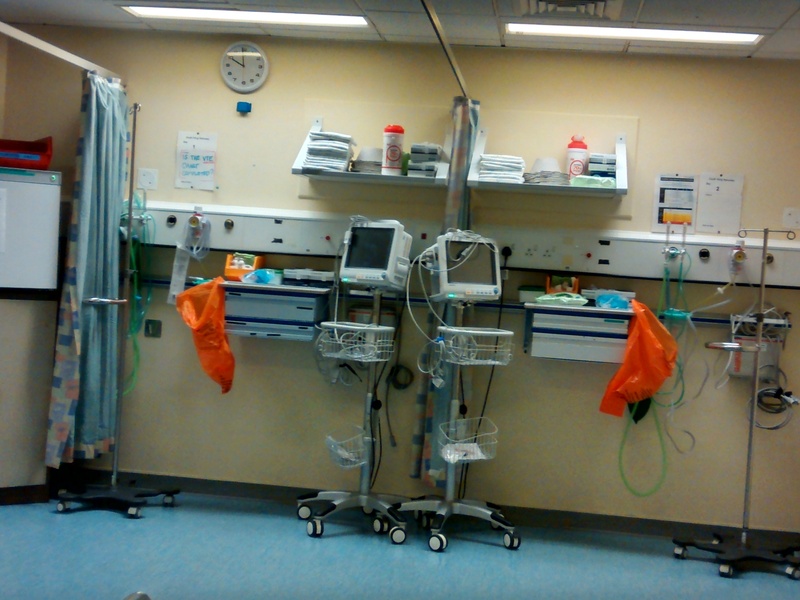 This entry was posted in Health and tagged doctor, Dorchester County Hospital, Dorchester hopsital, Dorset, GP, hospital, NHS, surgeon, surgery. Bookmark the permalink. 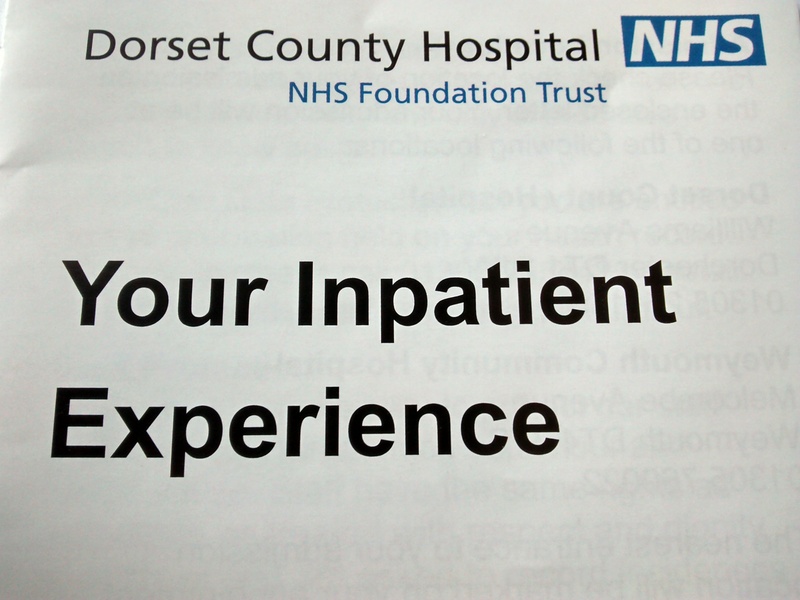 I to had a good experience of Dorchester Hospital when I had a cataract done in 2011. Hello Anthony! Yes, they certainly seem to have a good team there don’t there. Hope all is well with you and life still treating you well.